Season Notes: Signed PTO w/ T-Birds on Mar. 22... Before Springfield, signed PTO with Utica Comets on Dec. 19. Spent majority of season with Manchester posting 39 points (17-22-39) in 33 games played. 2016-17: Skated in 40 games with the Ontario Reign collecting eight points (1-7-8) and 64 penalty minutes. Career Notes: Played majority of rookie season in 2015-16 with Reign appearing in 41 games amassing 11 points (5-6-11) and 32 penalty minutes. Skated in three games with Manchester posting one point (0-1-1) two penalty minutes. 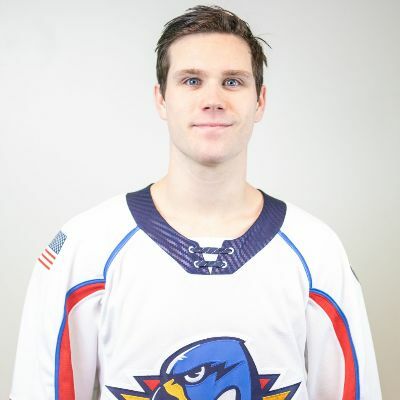 Amateur Notes: Skated four season at the University of Cornell from 2011-2015 totaling 111 games with 77 points (29-48-77) and 155 penalty minutes. Played two seasons in the BCHL with Victoria from 2009-2011 amassing 111 points and 90 penalty minutes in 99 games.